After spending almost an entire month in Mexico City, I decided it was time for a little “weekend getaway” action. 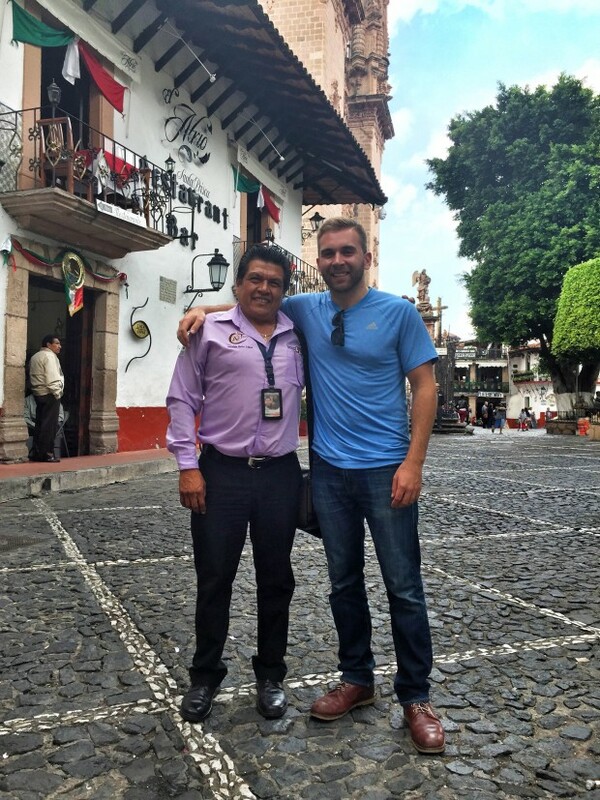 So, I did a little research, sent out a few emails, and was lucky enough to work out a collaboration with the very helpful Tourism Board of Taxco to make a visit a reality. 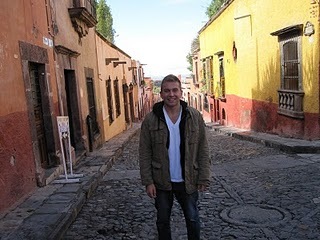 Believe it or not, the bus system and overland travel in Mexico is very easy, convenient, safe, and cheap. I opted for an Executive bus because it was at the exact time I wanted to leave, but the first class bus options are almost the same level of comfort and would have only cost me about $9 (opposed to the $12 I paid) for a one-way ticket including a snack and drink (I got a ride back from Taxco from a friend). 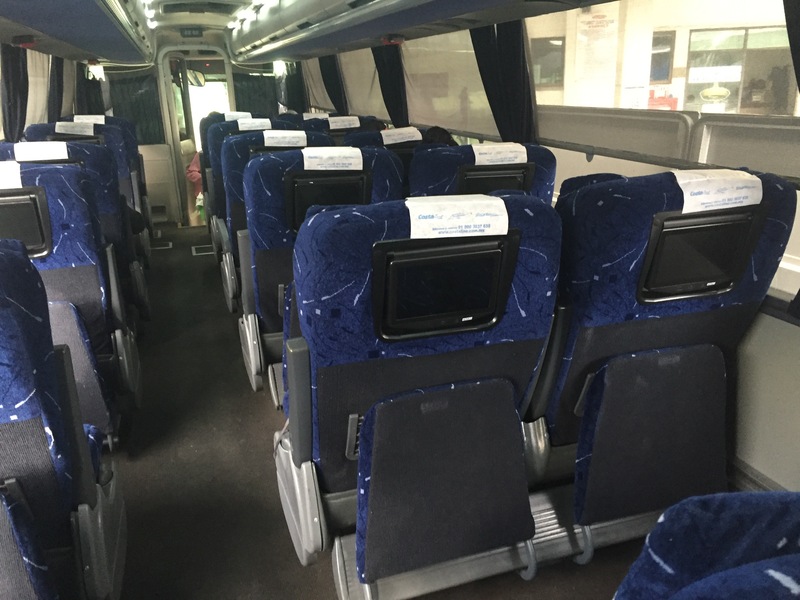 The buses normally have Wi-Fi, a clean bathroom and mine even had a private entertainment system! 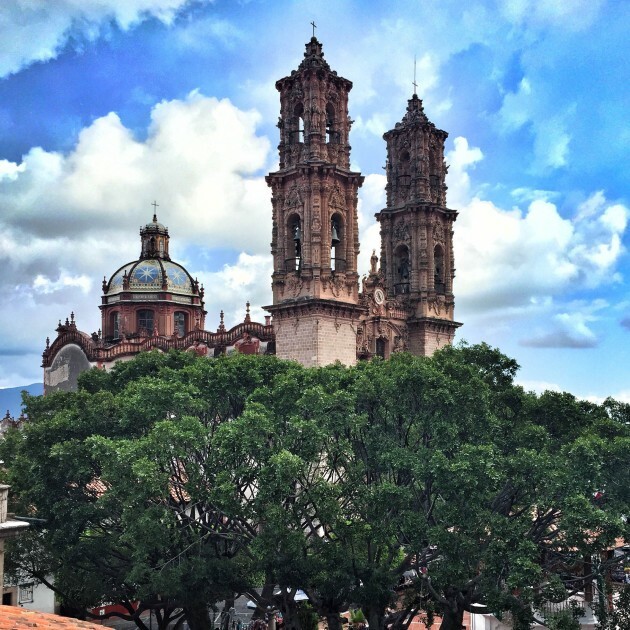 So, I started my weekend getaway with a quick 2.5 hour ride south of Mexico City through beautiful landscapes punctuated by green mountains and valleys until I reached the center of Taxco. 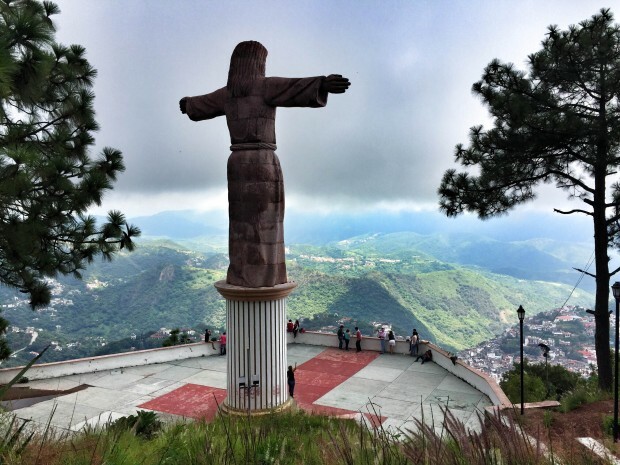 This small town only has around 40,000 people (as of the 2005 census) and is located in the state of Guerrero. The majority of the buildings are painted white, so when it first came into view, it was quite an impressive sight. The weather was perfect. around 70 F (21 C). 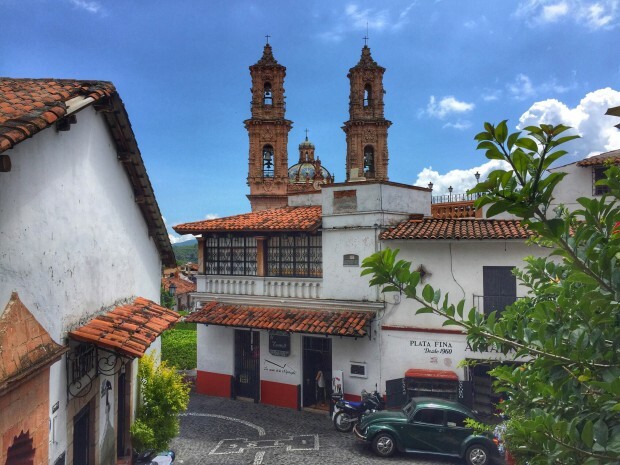 Taxco was one of the first silver mining cities developed by the Spanish and this history is evident in the beauitful colonial architecture and narrow cobblestone streets that wind around the steep hills that the city is built upon. Today, there aren’t any active mines, but there is a thriving silver market in which you can get some quality pieces for a fraction of the cost elsewhere. I’m not writing much about the silver aspect of Taxco, as you’ll see it mentioned in anything you look up about the town. 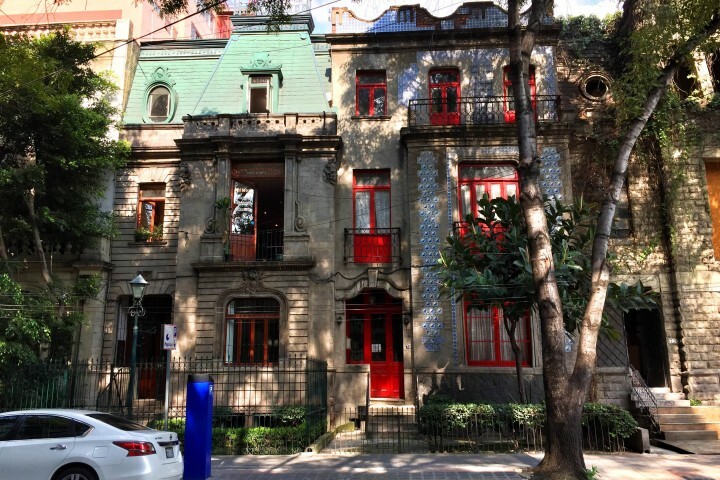 My first stop after a quick walk from the bus station was the beautiful Hotel Agua Escondida located right on the Zocalo (main plaza of the town). 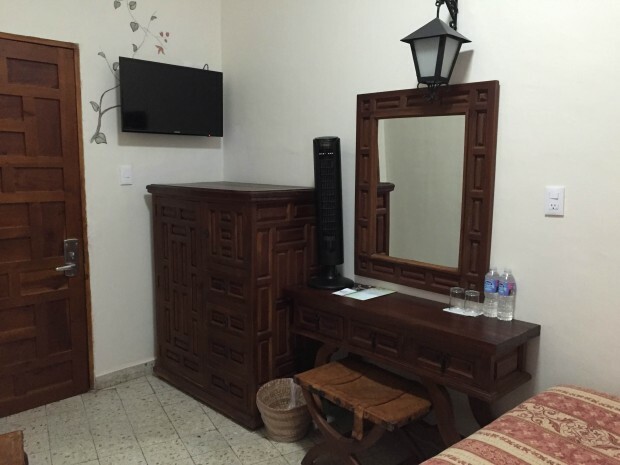 The staff was very friendly, helpful and the rooms are comfortable and affordable. 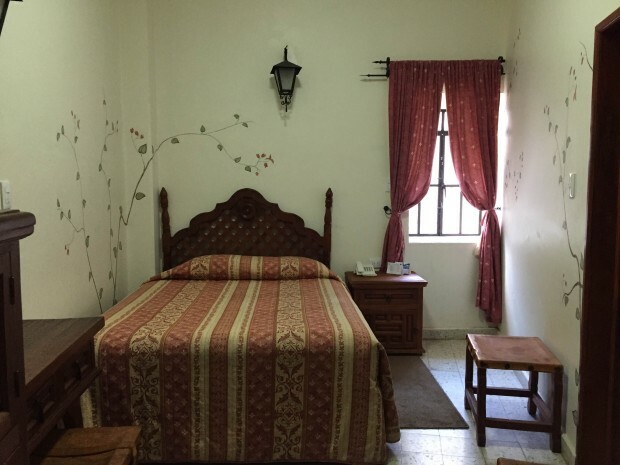 I suggest requesting a room not facing the main square if you’re sensitive to noise (the main mode of transport in Taxco is original VW Beetles which serve as taxis and are definitely cool, but can be a bit loud). The hotel has a great restaurant, and on Sundays, serves a delicious buffet brunch with authentic Mexican and international options. The rooftop bar/restaurant is also a fantastic place to grab a cocktail, check out the view! After dropping off my bag, I met with my local guide from the Tourism Board, Nancy Sanchez, who was an absolute doll and fantastic Taxco ambassador to explore the city with. Our first stop was the Casa de las Lagrimas (house of tears), a once colonial mansion now turned museum. It has basically been everything you can imagine over the past few hundred years and a crap ton of people have died there, some by natural causes, some not by such natural causes. 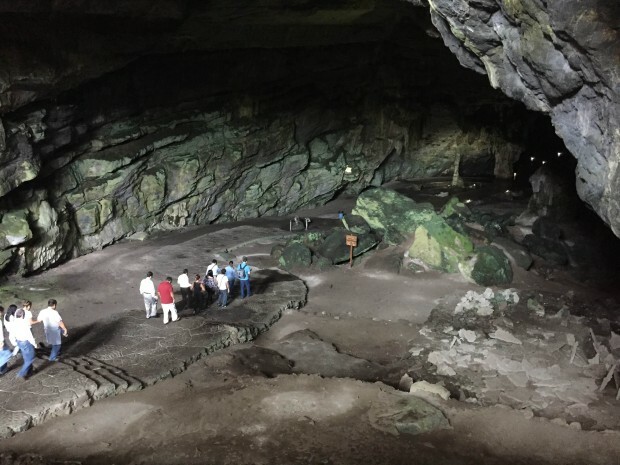 Supposedly, it’s extremely haunted and believe it or not, all my pictures from inside came out terribly upon review (the tour guide told me this is one of the curses of the press that visit!!!! 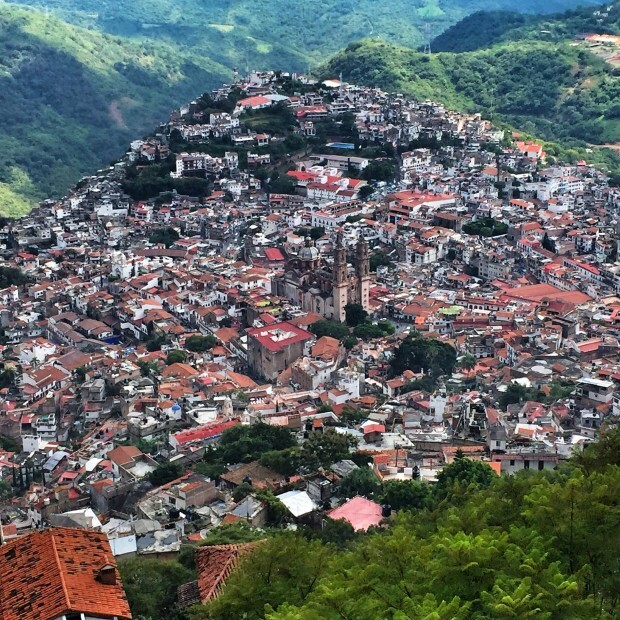 ), So, if you’re interested in the darker side of Taxco, definitely check it out (it’s not that scary, don’t worry). 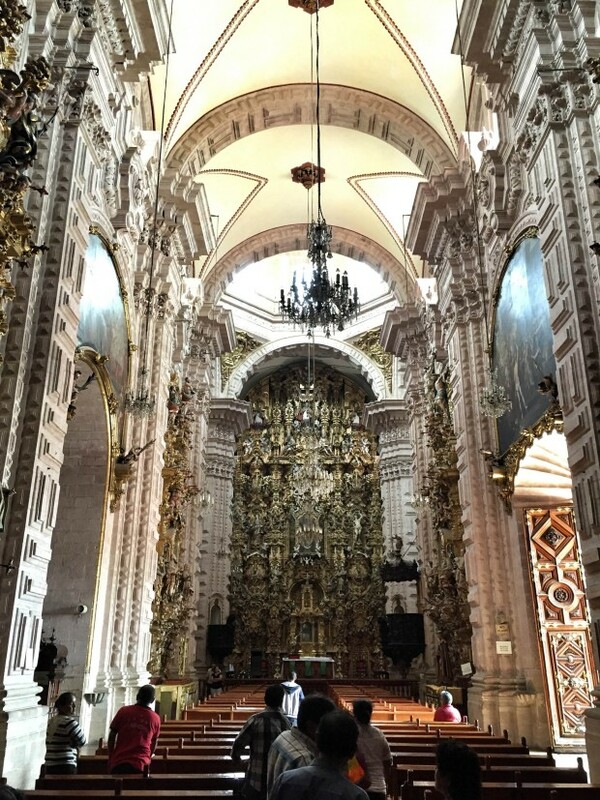 We then made our way back to the Zocalo to explore the main church, La Iglesia de Santa Prisca. 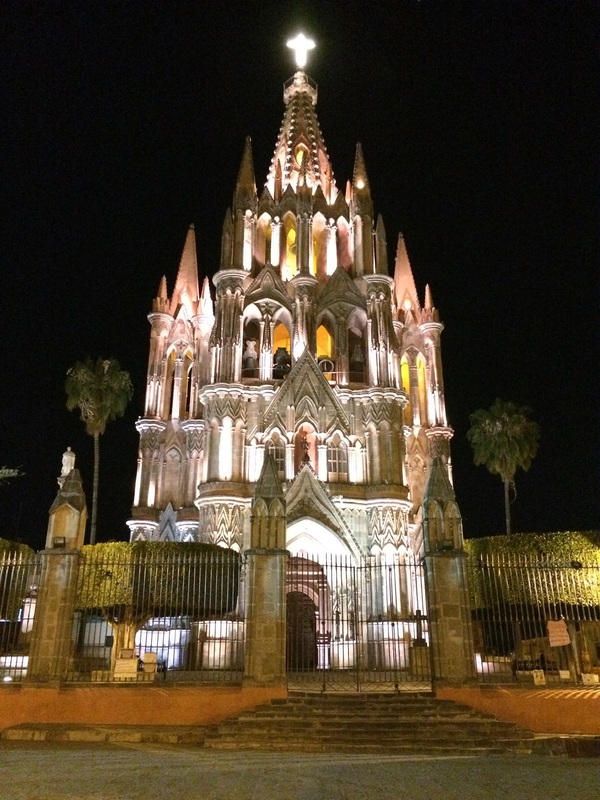 I have to say, Santa Prisca Church is one of the most attractive ones I’ve seen in the entire world, and that’s hard to write after visiting the one in San Miguel de Allende, St. Peter’s Basilica, etc. It was built between 1751 and 1758 and completely financed by one man, Jose de la Borda, a Frenchman. At one point, he was the richest man in Mexico (now it’s Carlos Slim who’s worth 73 B!) from the fortune he amassed after opening mines in Taxco and Zacatecas. The church is a late example of Churrigueresque architecture and no expense was spared in decking it out, inside and out. 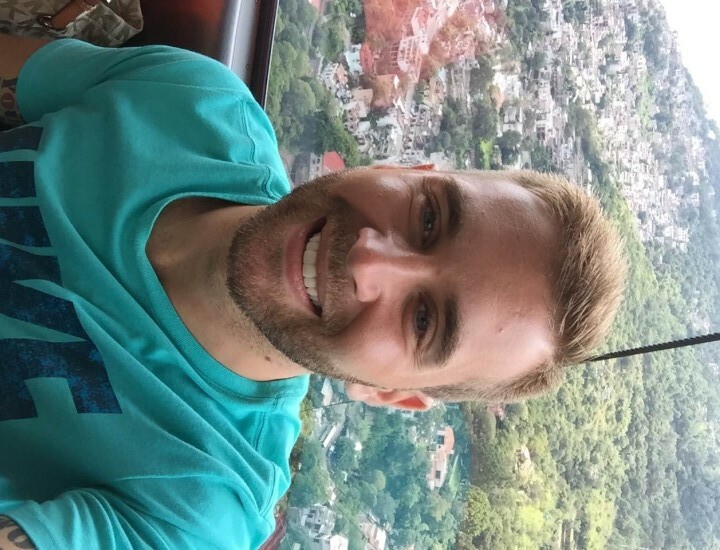 My guide, Nicolas Brito, was extremely knowledgeable and went over the entire place with me. In one of the back rooms there is a very cool optical illusion. Check out the pic below. It looks like I’m walking on a peak in the floor and that it’s made of different colored woods. 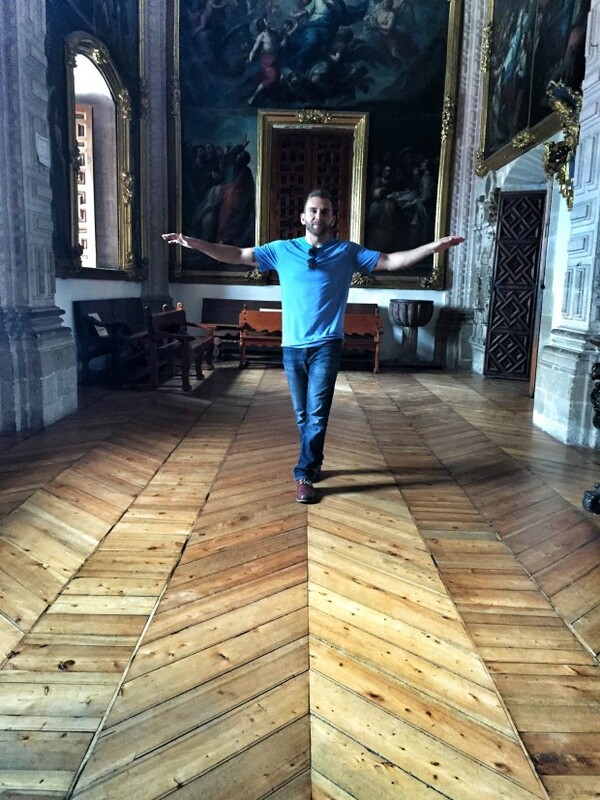 The floor is in fact completely flat and all one color, but the way the boards are aligned, and the way the light hits them, creates the illusion. 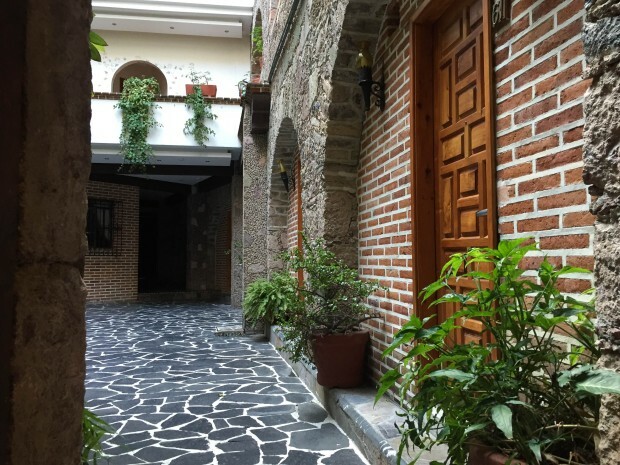 By 3 PM (normal lunch time for Mexicans), I was starving and we headed to the Hotel Posada de la Mision, another beautiful and historic hotel in the historic center of Taxco. The hotel has 3 major attractions beyond its rooms. 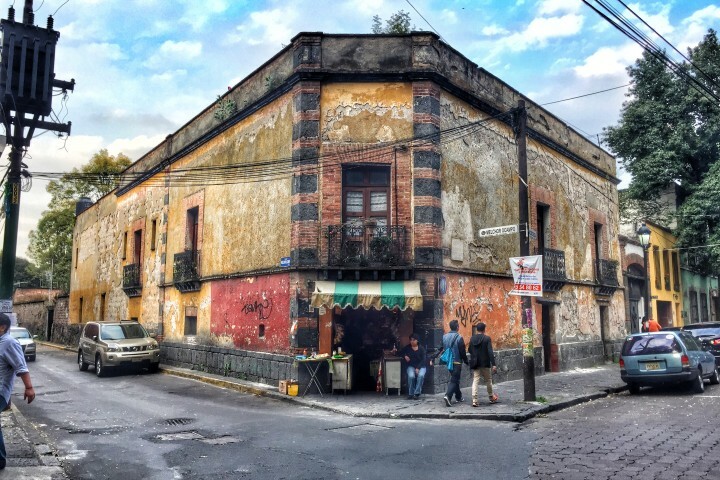 Firstly, it’s the birthplace of Mole Rosa. A delicious dish which is made with succulent chicken breasts smothered in a traditional Mexican mole sauce. But, this mole is unique as it’s made with piñón, which is a seed from a small pine tree indigenous to Mexico and the southwest US, (the seeds are expensive). It was delicious! 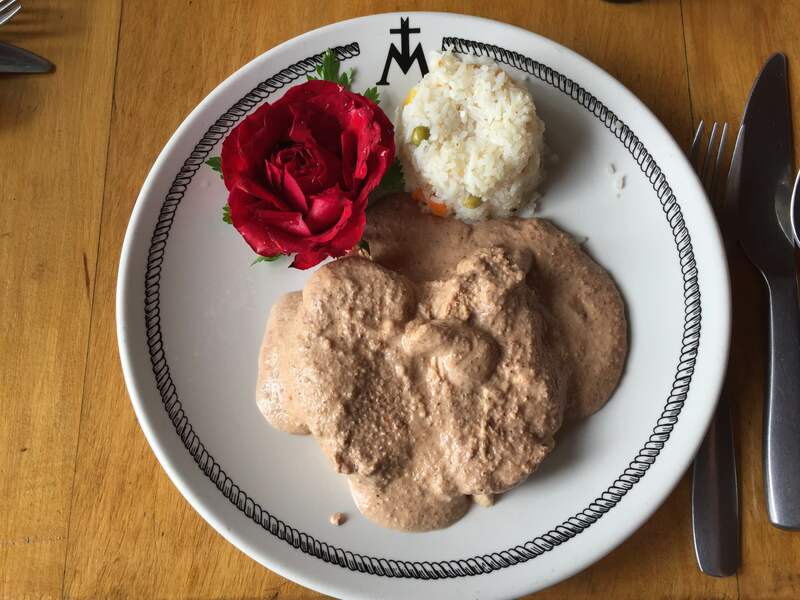 Mole Rosa is something special that a few places in Taxco make, but the recipe was created here at the Hotel Posada de la Mision. 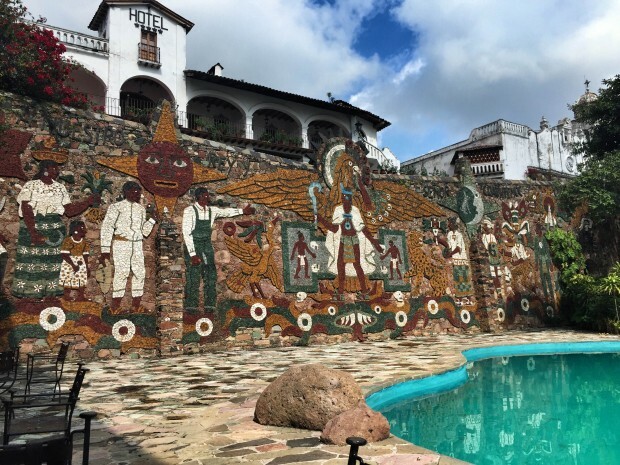 The second attraction at the hotel is the beautiful mural by famous muralist, Juan O’Gorman that looks over the pool. He is most famous for the amazing murals he did at UNAM, The National Autonomous University of Mexico, which is the biggest university in Latin America. You can see the famed UNAM murals on this post. The third thing to see at the hotel is probably the coolest. Recently, the hotel decided to expand the bar, and when they began to dig for the foundation, the discovered an abandoned mine below! Now, they’ve turned it into an attraction and you can take a guided tour. 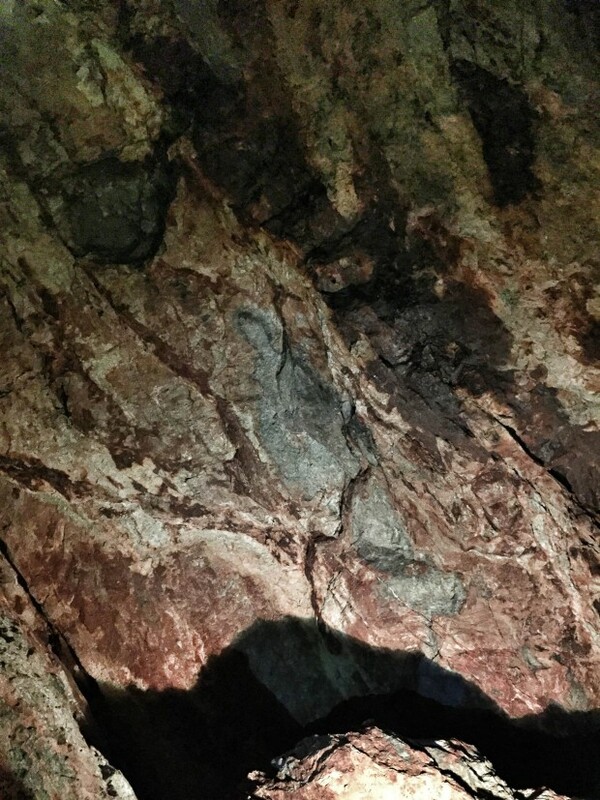 There is even a natural (who knows) “appearance” of the one and only, Virgin Mary! 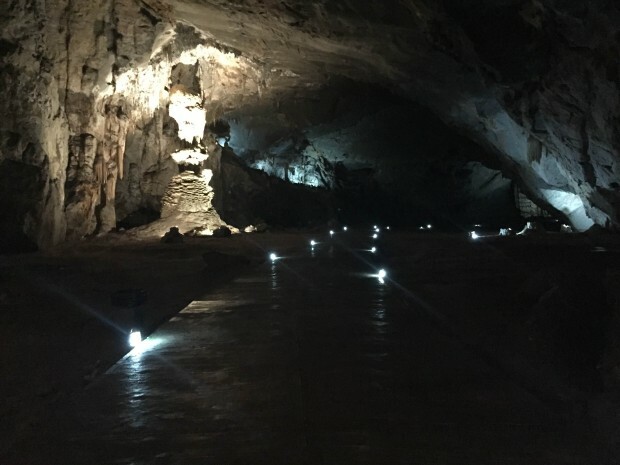 The entrance to the cave is pretty impressive as you get your first glimpse of how vast the space is. The route is extremely well done and there is an illuminated concrete walkway the entire way. Our tour guide would crack jokes (in Spanish) as he pointed out rock formations that resembled things like broccoli, lions, monkeys and even Jack from Titanic (not kidding!). 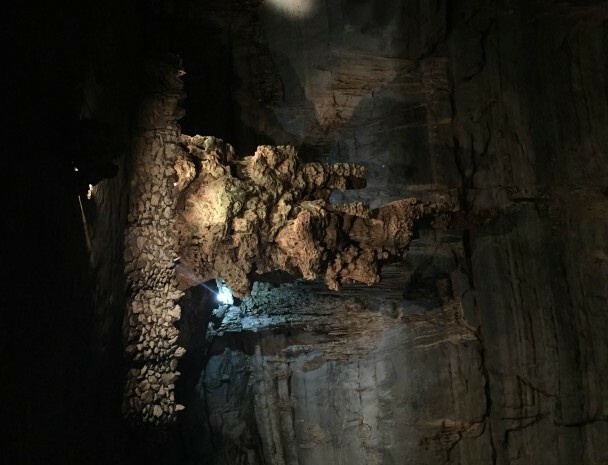 Every time we walked into a new passage, it would be almost pitch black and then the guide would hit a switch and the massive formations would illuminate, it was wild. About 1 km under the mountain there is stadium seating for live concerts which are special as the space has very unique acoustics. You could click with your tongue and hear an echo for almost 10 seconds. Our last stop was the Taxco teleferico (cable car) that is owned and operated by the Hotel Monte Taxco. 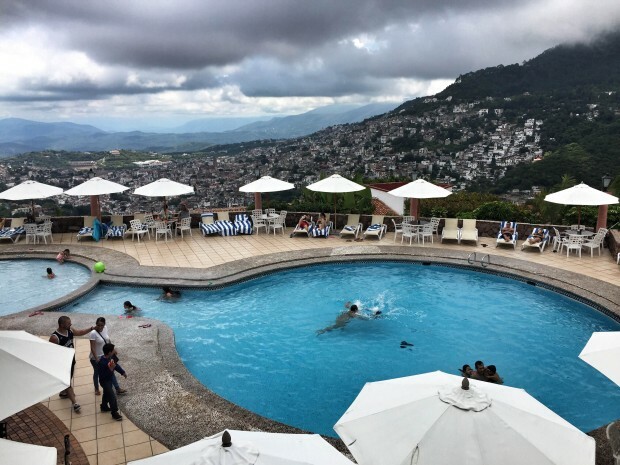 It’s a short but scenic ride and the view from the pool over Taxco is stunning to say the least. 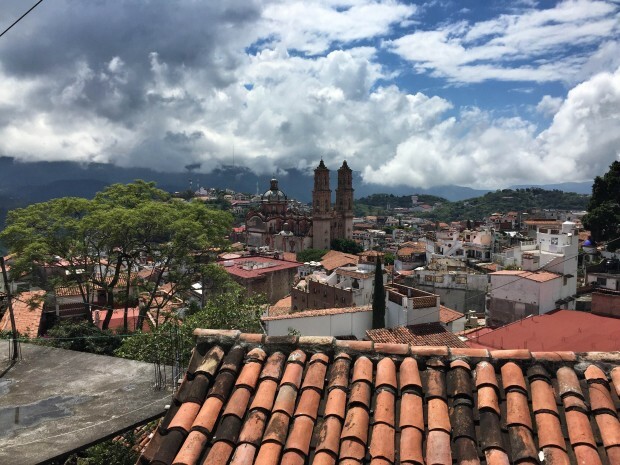 All in all, I had a great weekend in Taxco, and if you’re in Mexico City or somewhere like Cuernavaca which is only an hour from Taxco, it’s definitely worth stopping by for an afternoon, night or even two. My trip to Taxco, Mexico was in collaboration with Tourism Board of Taxco and Hotel Agua Escondida. A big thanks to the aforementioned parties and everybody else on my trip who made it an awesome and memorable experience! All opinions expressed above are my own.